Howling Dog Rescue, Inc.: Meet the Board of Directors at Howling Dog Rescue, Inc.
Howling Dog Rescue, Inc. offers a safe haven to northern breed dogs that have been abandoned. 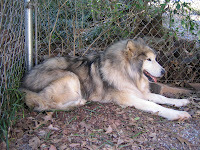 The organization is dedicated to helping malamutes and sibes, their crosses, and their friends, who need rehoming. Meet the Board of Directors at Howling Dog Rescue, Inc. Potential placements through HDR, Inc. are handled by an oversight committee. Meet Huck Finn, the current Director of Operations, shown in the third photo from the top. Mr. Finn was ably trained by his predecessor, Atlanta Jad. Jad is the woolly pictured in the bottom photo. They almost always seek input from their senior advisor, Red Emma. She's pictured in the woods with emeritus board member Sash. It's the photo at the top. If a decision isn't clear, they'll bring in the youngest, most devilish member of the crew, Nilak. She's in the fourth picture from the top. As a last resort they draw on the wisdom and experience of emeritus board members Seavey and Nomarak's Meesha. But those two are usually too busy hunting in the creek pictured in second photo from the bottom. On the really tough calls they'll even consult with three old timers, Kobuk shown sitting in the second photo from the top along with Mook and Doctor, who is in the fourth photo down. All committee members are staunch advocates of and adherents to the Malamute Resistance Movement.